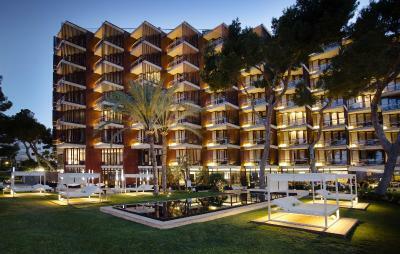 Lock in a great price for Gran Melia de Mar - Adults Only – rated 8.8 by recent guests! Our stay was great at the hotel. The staff was very nice and helpful. The housekeepers were wonderful, came twice a day and did an excellent job. And they loved our dog :) The lady who hosted us at breakfast and dinned was amazingly attentive, remembering all the guests' names and making us always feel special! It was very pleasant to spend all day at the hotel, swimming in the pool or sea and lounging in the shade! The food at the restaurants was very good as well. The attention to every small detail, from the clarins products to the quality towels to the champagne and cheese platter, was the best of all the hotels we stayed at previously! Service wasn't great very slow ! Other than that everything perfect ! 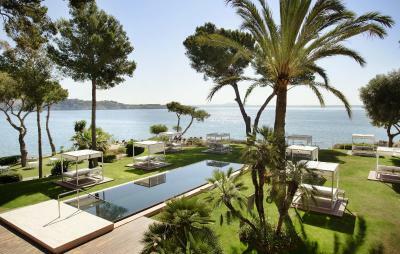 It is a beautiful property set in the perfect Mallorcan location. Food was excellent with the most amazing staff. Martha, Dominique Paris, Toni and James are just a few who were impeccable in their service to us. They made us feel at home and ensured our comfort at all times. The staff were amazing. In particular, the breakfast egg chef was a ray of sunshine. The front desk, restaurants, Spar, room services , and whom I forgot to mention were very professional. All rooms have sea view. These were modern and very comfortable. The breakfast was extensive and the staff were lovely. I can't think of anything that we didn't like. There is even a bus stop just o/s to get to Palma amongst other places. Great service, friendly staff, several restaurants to choose from, breakfats is very diverse and generous, great views, wonderful spa, pool area is very nice, plus the hotel is close to Palma, so you can move around for more dinner options. 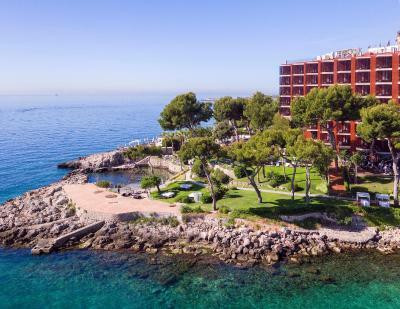 Gran Melia de Mar - Adults Only This rating is a reflection of how the property compares to the industry standard when it comes to price, facilities and services available. It's based on a self-evaluation by the property. Use this rating to help choose your stay! 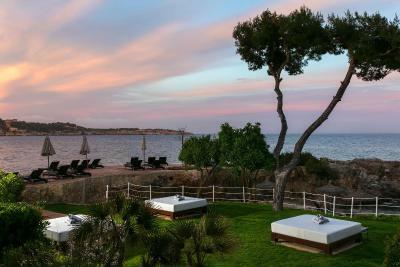 Located on the sea front in Illetas, Gran Melia de Mar-Adults Only is set within beautiful gardens and features a small exclusive beach. This stylish hotel features 3 swimming pools and an extensive spa. Each of the bright, air-conditioned rooms at the Meliá has stylish, modern décor, a flat-screen TV and a special pillow menu. 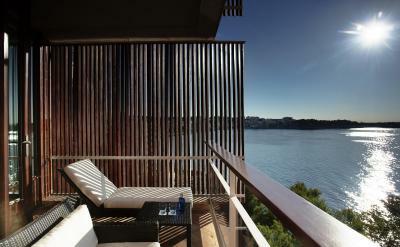 Rooms also feature balconies with sea views. Red Level guests enjoy additional, exclusive services such as free valet parking, VIP check-in, free Nespresso coffee, free access to the Spa's thermal circuit and access to the Red Level lounge with free drinks. For an additional charge, guests have access to the SPA BY CLARINS, where health and beauty treatments are available. The spa includes a Finnish sauna, Turkish bath, hot water indoor pool and a hot tub. The fitness center is available 24 hours and it is free of charge. Gran Melia de Mar has 4 restaurants, including the the Amaro Lounge, which offers light food, drinks and cocktails, a poolside restaurant Bardot, specializing in fresh fish, rice dishes and seafood meals. Arrels by Marga Coll is a fine dining restaurant offering tasting menus, with a beautiful terrace and sea views, serving traditional Mallorcan cuisine with a modern twist, and is only open for dinner. Perseo offers a Mediterranean dining experience with sea views and surrounded by pine trees. 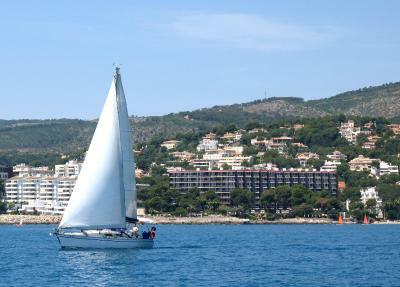 The hotel is a 10-minute drive from Portals Nous Marina and central Palma is just 4.3 mi away. Bendinat Golf Club is a 10-minute walk from the Meliá. This property also has one of the top-rated locations in Illetas! Guests are happier about it compared to other properties in the area. 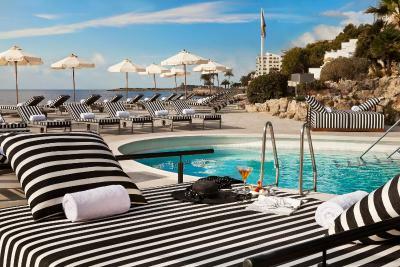 When would you like to stay at Gran Melia de Mar - Adults Only? 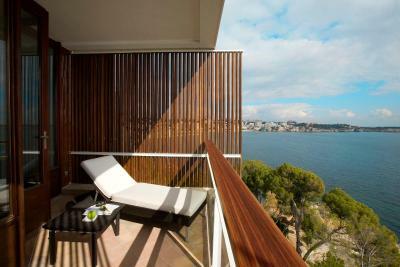 This bright, air-conditioned room features a furnished balcony with views of the sea. It has stylish, modern décor and a sofa. 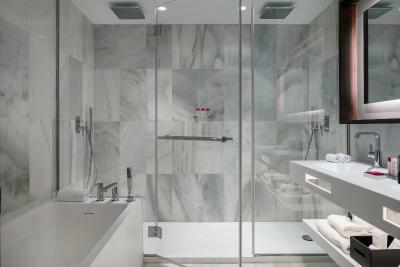 It comes with a flat-screen TV, and a private marble bathroom with a rain-effect shower. This room has VIP toiletries, a pillow menu, and a Nespresso Coffee Machine. The spacious Grand Suite features 1 bedroom with a king size bed. There is a lounge area, dining area and 2 balconies offering sea views. 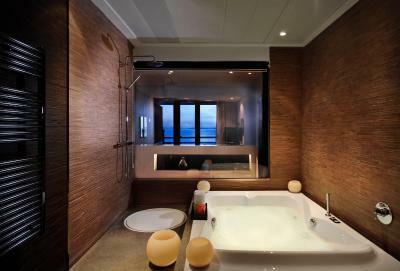 The spacious bathroom includes a hydromassage bath and rain-effect shower. A special pillow menu, a choice of aromas for the room, and ironing service of one item per stay are also available. - Free unlimited access to the thermal circuit at Spa by Clarins. 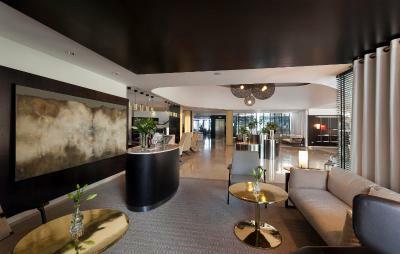 - 24-hour access to Red Level Lounge with free water and coffee, tea facilities. 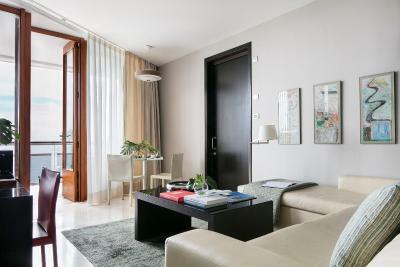 This bright, air-conditioned room has stylish, modern décor and a sofa. 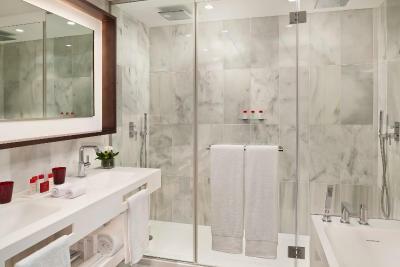 It comes with a flat-screen TV, a special pillow menu, a choice of aromas for the room, and a private marble bathroom with a rain-effect shower. 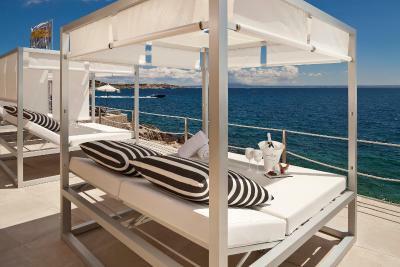 It has a balcony offering spectacular sea views. This spacious suite boast a large seating area with direct access to a private terrace with sea views. 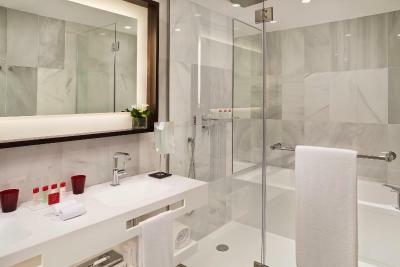 It features a flat-screen satellite TV and a private marble bathroom including bathrobe, free toiletries and hairdryer. 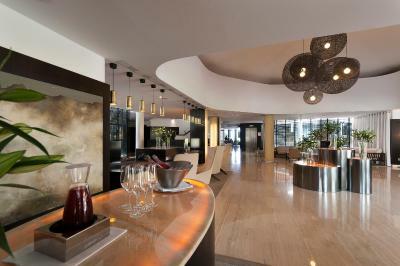 - 24-hour access to Red Level Lounge with free water and coffee, tea facilities. Continental breakfast from 09:00 to 11:30, drinks throughout the day, and appetizers from 18:00 to 20:00. 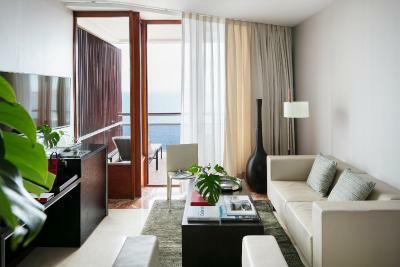 Located in privileged areas, this bigger suite features a living room with access to a private terrace with ocean views. Royal Suites have 2 private, furnished balconies with privileged exterior views, a marble bathroom with a bathtub and a cabin with a rain-effect shower. The double bedroom comes with a king size bed. This room has VIP toiletries, a special pillow menu, a choice of aromas for the room, and ironing service of one item per stay. Located on the 6th floor, this bright, air-conditioned room features a balcony with stunning sea views. It has stylish, modern décor and a sofa. 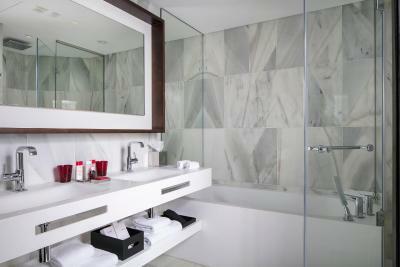 It comes with a flat-screen TV, a pillow menu and a private marble bathroom with a rain-effect shower. Guests staying in this room have free access to the SPA by Clarins thermal circuit. 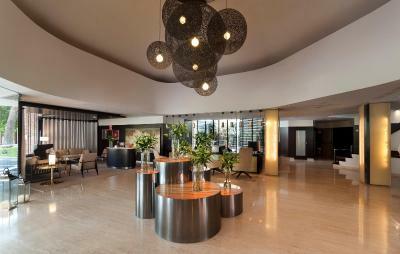 House Rules Gran Melia de Mar - Adults Only takes special requests – add in the next step! 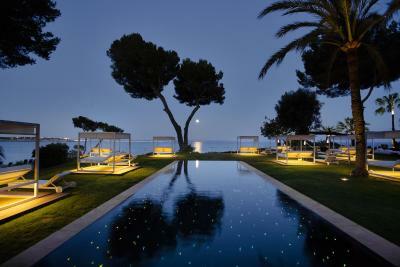 Gran Melia de Mar - Adults Only accepts these cards and reserves the right to temporarily hold an amount prior to arrival. Adults only, refers to adults and children aged over 15 years of age. Please note that the parking services include valet parking. Please note, when booking 9 or more rooms, different policies and additional supplements may apply. Please note that Arrels Restaurant is not open daily. Please contact the property for opening times. Some of the loud clients at the swimming pool who thought they were in their private back yards but of course that’s not the hotels fault. We are definitely going back . The food and drinks at this hotel are on another level of ridiculously priced! Most of the cocktails are between €18-€42. We paid €42 for a jug of sangria... across the road the same jug is €10. It's actually laughable that they are ripping their guests off like this!! The staff around the pool area are lazy and don't walk around asking guests if they would like anything. They take forever to deliver the drinks. Every time I had to get up and order from the bar. They don't clean up behind other guests/ remove towels from seats not being used. Premium prices for absolutely shocking service from the bar/pool staff! I witnessed several guests complaining to the staff and they didn't even apologise. They add a cost on for service at the pool — the hotel needs to take that cost off (what exactly are we paying for here?!) I wouldn't recommend booking a day bed. Honestly to spend Ninety Euro's on an outside seat when you can book a pool deck chair just makes ZERO sense to me. We didn't upgrade to red level as we couldn't see the point — and I'm so glad we didn't. My husband and I ate at the restaurant downstairs — again, prices were sky-high. I must just say the hostess downstairs was extremely sweet and helpful in finding us a seat as we had not reserved. My husband ordered fish and it was overdone and not very tasty. Mine was fine but the portions of food were teeny tiny. It was a very disappointing dinner. The restaurant directly across the road is 100 times better and great quality for money. Don't waste your money eating and drinking at the hotel. The restaurants across the road and in the area for breakfast, lunch and dinner are much better value. Upon arrival we were greeted by the gentleman who handles the door and luggage — I'm unsure of his name but he was incredibly sweet and polite, welcoming and helpful! We were checked in quickly and shown to our room. All the rooms have a fabulous view of the ocean — I can't imagine any of the rooms have a bad view as they all face the same side. We booked a deluxe double room without breakfast and it was perfect. We went out every morning for lovely breakfasts in the area. The rooms were modern, spacious and clean. All have a balcony and lots of closet space to unpack your things. Beds are comfortable and the linen is soft and clean. Coffee and milk in the room are topped up every day by room service which is a nice complimentary feature. The rooms are stunning. We requested a late checkout at 2pm. The hotel offered us a complimentary room to use for showering in the early evening as our flight was late at night. I loved that they did this! Thats the kind of service one would expect at a 5 star hotel and it was great! All the staff in reception were so helpful and polite! Lack of a sandy beach. Pool too deep. The pool area was great, but if you care for some sand, the closest beach (large enough with proper facilities) is a 20 minutes walk. Other than that, everything great at this hotel, would highly recommed it. 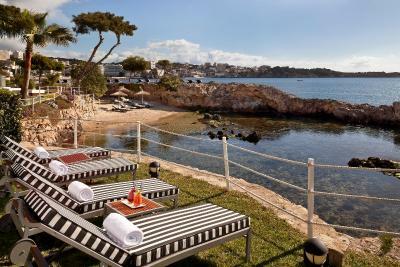 Incredibly comfortable bed with thick topper, smiley staff and lots of sunbeds in quiet, yet sunny areas of the gardens. Stunning evening views with a beautiful sunrise too..
We complained to the hotel as we the room next to us were noisy until 4am preventing us from sleeping. We did not find that the hotel dealt with this at all. You do expect to be able to sleep especially in a very expensive hotel! The staff were really friendly. The views were spectacular. The pool and beach are lovely. Great restaurants. The hotel has a great sea view, direct access to sea for swimming and the sun beds from the green garden are perfect for relaxing after long distance swim or for reading. The food was excellent, the staff - very happy to serve you and respectful (Mr. Jaime has a bonus here for his careful and pleasant way to help). The location is perfect for rest and sleep. In two words, a perfect holiday. 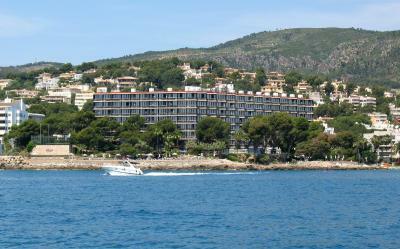 Fantastic hotel, staff very helpful, food lovely, room lovely with great views. Pool area is very nice. The rooms are a bit old. The staf are very very rude. The manager was even more as he was defensive when hearing our complaints. Room service keep entering the room without permission and cleaning was bad. The restaurant service is bad as I waited 50 minutes.